It’s a good market in which to stick with what’s working while never letting go of the notion that it could all end in one big flash – flash crash that is. They say as January goes so does the rest of the year on Wall Street. Let’s hope so, especially now that the Federal Reserve is officially on hold. Indeed, now that the Fed is taking a break, the headlines that move the market and the algos are likely to come from other sources. Of course, there are plenty of serious candidates for algo headlines. Consider all the political hot spots in the world just as the U.S. earnings season kicks off in earnest and the shutdown in Washington continues. Moreover, even as we scan the shadows for possible nasty things, it is plausible to consider that there may be a positive surprise coming from the U.S.-China trade talks given the recent backslapping by both parties after recent talks and reports over the weekend that China is moving toward easing restrictions on foreign investments. Given the way the White House likes fanfare, this would be an opportunity to shift eyeballs away from the government shutdown. Certainly no one expected a reworking of NAFTA and the subsequent surprise news from GM this past week. Thus the current rally in stocks could be a sign that the smart money (if there is some left that isn’t fueled by algos) is sensing a significant reversal of the current order. And if stocks can deliver a few more days of bullish activity onto the price charts, the bears that are still alive will have to capitulate, likely sending prices even higher for the short term. So, if and when this is how things develop, we could actually see the end of the bear market and perhaps the start of something more profitable. Still it’s never a good idea to go about any trading endeavor without asking yourself: what could possibly go wrong? And in this case, just about everything could. The New York Stock Exchange Advance Decline line (NYAD) continues to be the most accurate indicator of the stock market’s trend since the 2016 presidential election. For one thing it correctly predict the bear raid in the fourth quarter of 2018 when it failed to make a new high in September to confirm a marginal new high in the S & P 500. This event set up a technical divergence which proved to be correct in predicting the bear market that followed over the next three months. Now much of that damage has been reversed with the most important sign perhaps being the rise of the ROC indicator for NYAD which measures momentum. This indicator has rocketed higher to a level not seen since December 2017. 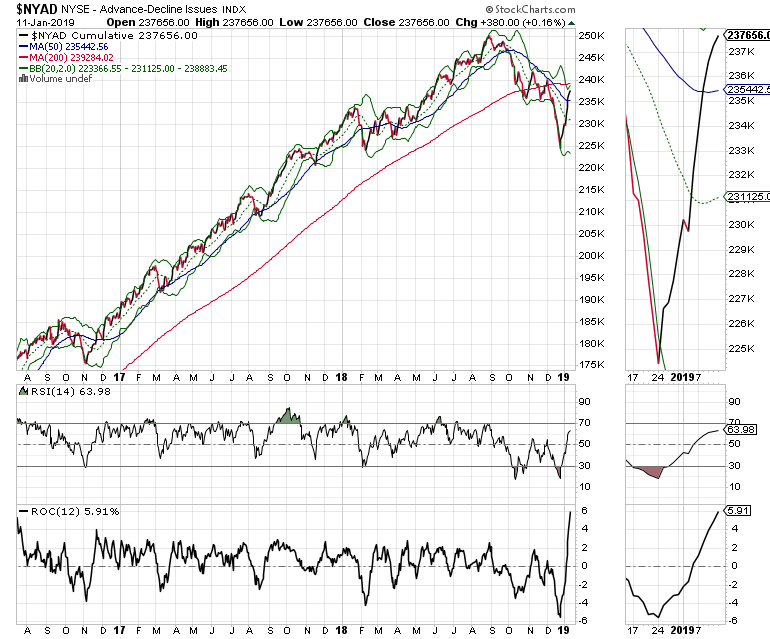 There is also improvement in the RSI indicator, while the NYAD itself is now within reach of its 200 day moving average. If NYAD can clear that 200 day line convincingly in the next few days to weeks, it will be very difficult to consider the bear market anything but over. 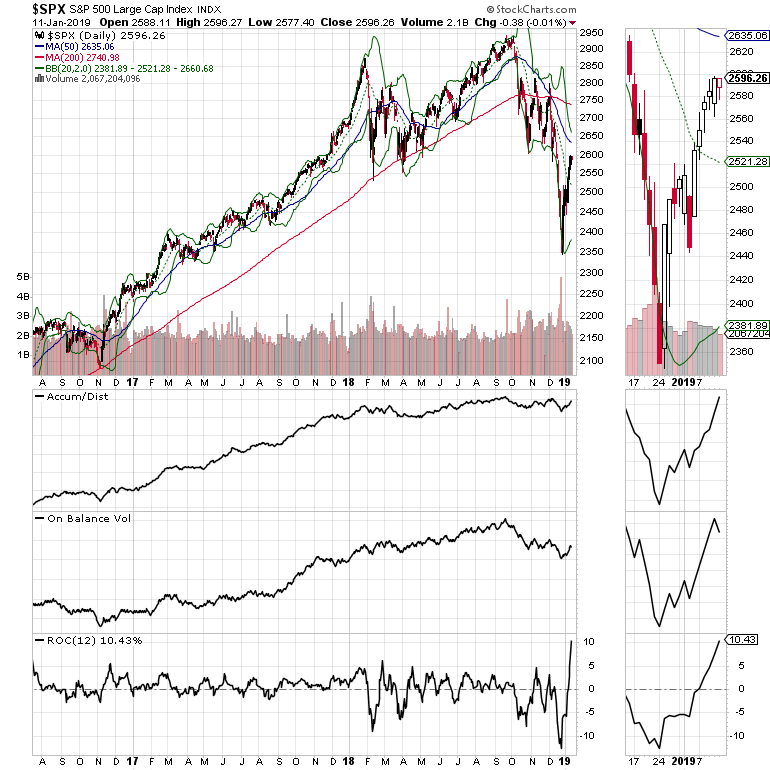 The NYAD is highlighting an improved market, yet the Nasdaq 100 (NDX) and the S & P 500 (SPX) are not quite matching the success suggested by the market’s breath. Specifically, the On Balance Volume (OBV) on SPX is still lagging the increasingly healthy picture presented by the Accumulation Distribution (ADI), while these same indicators look a bit more in synch for NDX. 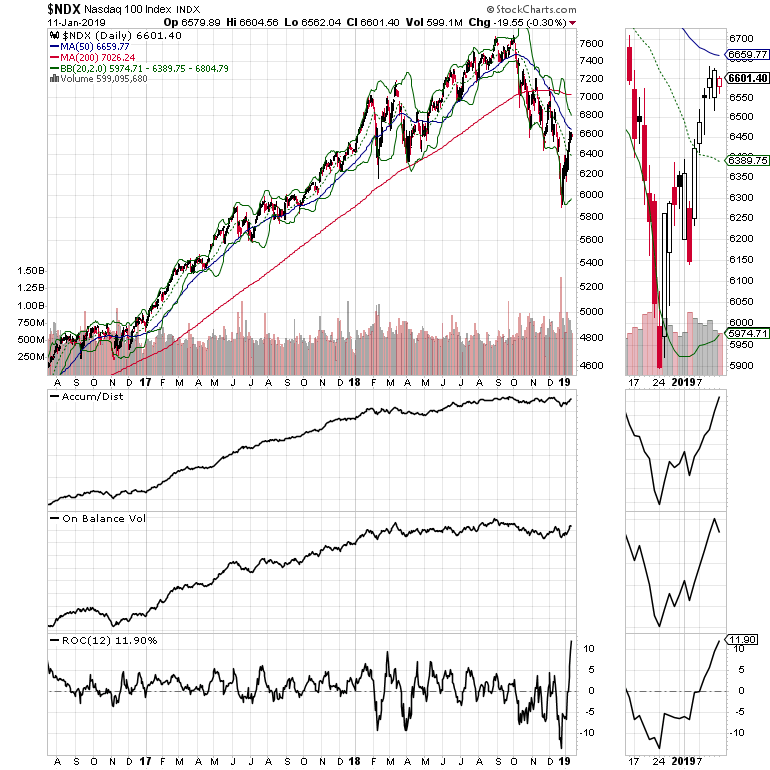 However, the one indicator which is similar on all charts, NDX, SPX, and NYAD is the ROC which shows that momentum in this market is on the rise, and that it is to the up side.